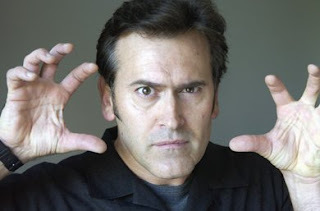 Bruce Campbell's latest movie, Raimi is considering Hobbit, the Joker ain't camp, Hitman has a plot and DVD sales drop. Chow bails on Woo, Harmon may bail on NCIS but Baldwin can't bail on 30 Rock. Prepare yourself for Star Robot Chicken Wars and a young Magneto.